Sen. Marco Rubio is pressing for more answers from President Trump's nominee for ambassador to Cambodia on his role in formulating the U.S. response to the slaughter of the Rohingya by the Burmese military. The Florida Republican grilled W. Patrick Murphy, the current principal deputy assistant secretary of the State Department's Bureau of East Asian and Pacific Affairs, on his role in the U.S. policy on Burma in the wake of the Burmese military's systematic killings of thousands of Rohingya civilians. "Were you engaged or not in the debate on whether to impose targeted sanctions on Burmese military leaders?" Rubio asked. Murphy responded that he has been a part of "our internal deliberations" in response to these attacks for the past several years but would not reveal his position saying that doing so would "tie the hands" of the Secretary of State Mike Pompeo on the policy going forward. "Deliberations are a constant theme of the shaping of foreign policy, and I'm not really in a position to reveal individual positions, but the results are incredibly important," Murphy said, referring to the State Department's decision in August to sanction seven Burmese officials and entities in response to their actions against the Rohingya. "I am fully supportive of those results, and I am fully supportive of ongoing efforts to achieve accountability for the egregious abuses that have been inflicted on the Rohingya people," he added. During Tuesday’' hearing, Sens. Ed Markey (D., Mass) and Cory Gardner (R., Colo.) supported Rubio's line of questioning and pressed Murphy on whether the Trump administration is working on a plan to try to hold the Burmese military accountable that included declaring the atrocities committed against the Rohingya as genocide. The bipartisan concern, led by Rubio, is significant and could spell trouble for Murphy's confirmation. Rubio also played a role in sinking the nomination of Susan Thornton as the assistant secretary for East Asian and Pacific affairs—a position charged with formulating U.S. relationships with 31 Asian governments—for being too soft on China. 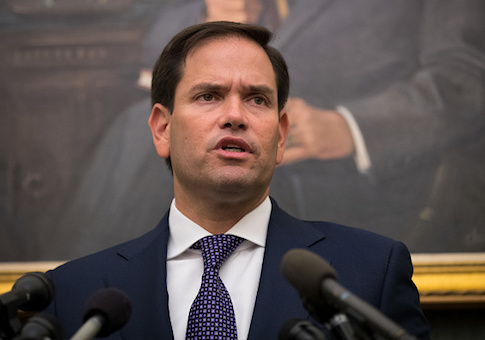 At the time, Rubio said she played a role in a policy that "undermined our strategic allies like Taiwan" and "downplayed China's human rights abuses and its export of authoritarianism" in exchange for smoother bilateral relations with Beijing. China largely supports the Burmese military but has an interest in good relations with Bangladesh, as well as Burma's stability. So far the State Department has stopped short, formally determining that the Burmese military's documented killing of thousands of Rohingya is "ethnic cleansing," which carries less legal force. Rubio on Tuesday referred to the decision so far to stick to "ethnic cleansing" as an issue of semantics. "In many cases, we're just playing games with names here—words and titles. In many ways, ethnic cleansing is genocide—it's just legal terminology for actions perhaps some don't want to take in the broader geopolitical perspective," he said during Tuesday's hearing. He made the comment during a related line of questioning on whether State Department officials have made a recommendation to Pompeo on whether to declare the mass killings of the Rohingya a "genocide." Two influential human rights groups on Monday released reports deeming the Burmese military's violence against the Rohingya "genocide" while the Trump administration has remained silent on the issue even after the State Department in September issued an exhaustive fact-finding report documenting the atrocities in detail. The Holocaust Memorial Museum and the Public International Law and Policy Group, which worked with the State Department on the administration's fact-finding report, both said the evidence they've gathered led to their conclusions that the atrocities amount to genocide. At the end of the hearing, Markey said he agreed with Rubio "very, very strongly." "It is important that we know if this administration thinks it's ethnic cleansing, crimes against humanity, or is it genocide, and what the plan this administration has to release that determination," he said. "Because a lot of the policy we have and the way the rest of the world is going to view this government in Burma is going to depend on the judgement that is made, and it hasn’t been made." Gardner concluded the hearing by stating that he's "going to go out on a limb here and suggest that the question that Sen. Rubio made was not answered." "I would just encourage you, in the coming days, to answer the question," he told Murphy. "The question is, if you were in a capacity in your previous role to make a recommendation to the secretary about violence and actions and activities against the Rohingya in Burma—what recommendations you've made to the secretary on how to respond." "That's what this hearing is really about," he said. "It's about the history, but it's also about the future and how you deal with the consequences of that. I think the more quickly we come to grips with it and name it for what it is, the more quickly we put in place policies that we can look back and be proud of—that we took the strongest possible steps." This entry was posted in National Security and tagged Marco Rubio. Bookmark the permalink.